The trial of Argentina and Barcelona footballer Lionel Messi on tax fraud charges has begun in Spain. Messi and his father Jorge, who manages his financial affairs, are accused of defrauding Spain of more than €4m (£3m; $4.5m) between 2007 and 2009. The authorities allege that the two used tax havens in Belize and Uruguay to conceal earnings from image rights. The Spanish tax agency is demanding heavy fines and prison sentences. They deny any wrongdoing. The trial is expected to last for three days, with Messi appearing in court on Thursday. Messi’s lawyers had argued that the player had “never devoted a minute of his life to reading, studying or analysing” the contracts. But the high court in Barcelona ruled in June 2015 that the football star should not be granted immunity for not knowing what was happening with his finances, which were being managed in part by his father. Messi and his father made a voluntary €5m (£3.8m, $5.6m) “corrective payment” – equal to the alleged unpaid tax plus interest – in August 2013. Messi is the five-time World Player of the Year and one of the richest athletes in the world. Having a well maintained office can benefit your business in far more ways than you may first think, and can really add to the continued success and growth of any company. The environment around us can have a huge impact on the way we feel, act and even think, so paying attention to how well you look after your workspace can have a really positive effect on how well the rest of your company performs. The first impression that a customer or visitor has of your company will play a major part in how they perceive your business, a pleasant office with presentable, efficient staff is far more likely to appear reliable and professional than somewhere that appears shambolic and disorganised. A well organised workplace makes it far easier for employees to find essential items, making it possible for them to carry out tasks far more effectively. Making sure that working areas such as desks are well equipped and clutter free helps to prevent staff from being distracted while working, helping them to be far more productive during their working day. Staff members with a well organised desk give a far more professional and hard working impression to customers and visitors. Having tidy and comfortable area to hold meetings will be far easier for members to focus on the subject being discussed, take notes or show presentations. Knowing that your office has strict hygiene standard can help to reduce employee sickness rates as it will be far more difficult for bugs and germs to spread among staff member, a clear and tidy working space also means accidents will be far less likely. Maintaining a clean and tidy workplace will help you ensure your meet health and safety standards and be far less likely to be sued if an accident does take place. People that are given an attractive and comfortable workplace are more likely to feel valued by their employer and satisfied within their jobs. Working in a messy disordered environment is more likely to cause stress to employees, affecting their performance and making them more likely to seek employment elsewhere. Making sure that the building, fixtures, fittings and equipment that you use is kept clean and well looked after means they are likely to have a far longer lifespan, saving you money in replacements and repairs. As many businesses recognise the importance of having a clean and well presented workplace they view hiring professional cleaning services as a worthwhile investment, having reliable and trustworthy cleaners that make sure everything is consistently clean and well organised is a valuable asset for any business and key to the smooth day to day running of any organisation. Having the peace of mind that everything has been cleaned ready for the working day is the ideal way to ensure you can greet customers and other visitors with confidence, nothing is more embarrassing than having no clean cups to serve coffee. Tories Michael Gove and Boris Johnson and Labour’s Gisela Stuart wrote in the Sun that the tax on energy bills cannot be scrapped because of EU rules. Chancellor George Osborne said this was “fantasy land” economics. Remain campaigners accused Vote Leave of promising a “make-believe land of milk and honey” if the UK left the EU. The Electoral Commission says that, even after recent surges in registrations, many people are still not signed up to vote. In their article, the Vote Leave politicians said they would seek to spend some of the cash saved by quitting the EU on cutting VAT from household gas and electricity bills, a tax imposed by a Conservative government in 1993. Mr Osborne tweeted his attack on Vote Leave’s claim, saying leaving the EU would lead to a smaller economy, “a hole in public finances” and higher taxes including VAT. Remain campaigners also released a report which they said detailed Leave’s “unaffordable” spending commitments. They said more than 20 commitments, totalling £110bn, had been made – eclipsing the potential saving from leaving the EU. Vote Leave said the Remain report contained “made-up” figures and that they had simply illustrated how money could be spent outside the EU. Meanwhile, Business Secretary Sajid Javid will warn of the impact of leaving the EU on small and medium-sized enterprises. He will cite Department for Business, Innovation and Skills analysis, estimating that 8% export to the EU and a further 15% are in the supply chains of other businesses that export to the EU. Britain Stronger in Europe said that amounted to about 1.2m firms. But Vote Leave’s John Longworth said the government’s figures were “extremely questionable”. The London market edged higher at the start of trade, but shares in the Daily Mail’s parent company slid after it reported lower profits. The FTSE 100 index was up 7.57 points at 6,270.42, with mining companies among the biggest risers. Shares in Daily Mail and General Trust fell 8% after the company reported an 11% fall in half-year profits to £129m. Print advertising fell 13%, outstripping increases in digital advertising revenues. On the currency markets, the pound rose 0.2% against the dollar to $1.4720, and edged up 0.1% against the euro to €1.3191. 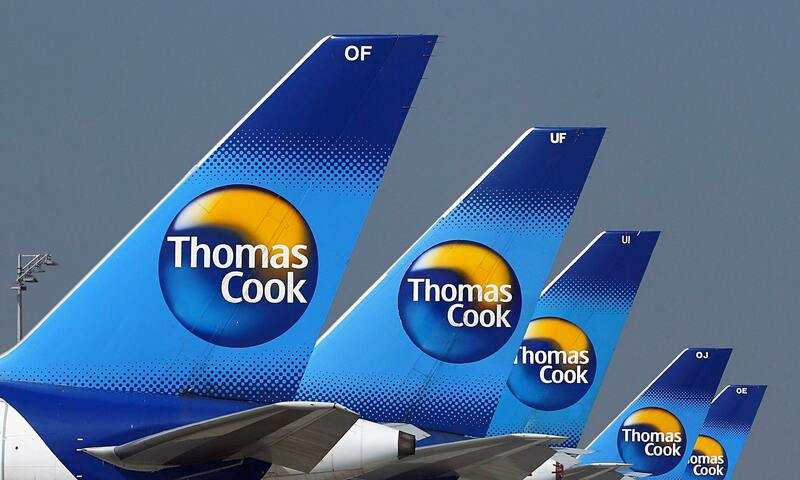 Thomas Cook cabin crew voted in favour of a strike in a row over health and safety, the Unite union has said. About half of union members voted, with 74% of those backing industrial action in the dispute over rest breaks. Thomas Cook Airlines said plans were in place to make sure customers would still be able to go on holiday in the event of strikes. The British airline flies more than six million passengers a year to the US, continental Europe, Asia and Africa. A Unite spokesman said union bosses would hold talks with the airline and conciliation service Acas on Thursday and next Tuesday. He said it was not the union’s intention to disrupt holiday plans during half-term, which for most schoolchildren begins this weekend. 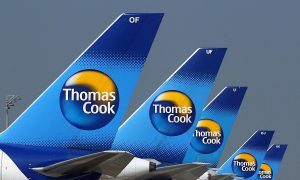 For a strike to go ahead, the union would need to give Thomas Cook seven days’ notice, and that notice has not been served. Thomas Cook has reduced its cabin crew’s breaks from one 20-minute break every six hours to one 20-minute break every 12 hours worked – the minimum indicated in the Civil Aviation Authority’s guidelines. Unite says crew should have at least two 20-minute breaks every 12 hours. A spokesman for Thomas Cook Airlines said: “We’re disappointed Unite cabin crew members have taken the decision to vote for strike action. “The safety of both our people and our customers is our top priority and we rigorously adhere to the rules around crew breaks.” He said the airline was “committed” to working with Unite to find a solution to end the dispute. Thomas Cook Airlines has a fleet of 31 planes, employs 2,500 people and has its head office at Manchester Airport. HS2 is an over-priced, gold-plated project and will fail in many of its objectives, a group of transport experts has warned. The academics support high-speed rail overall, but say HS2 is five times more expensive than its French equivalent. They argue that the benefits of HS2 can be achieved much more cheaply, with lower CO2 emissions, and they want their analysis examined by government. A spokesman for HS2 said options for bringing down costs were being studied. But the academics, including some leading lights in transport, list a series of complaints about the current version of HS2. HS2 has been designed to increase capacity and connections, regenerate the North and reduce climate impacts change. Yet the critics say it will only achieve one of these – capacity. Many key rail journeys, they say, would be worse, including to Nottingham, Stockport and Wakefield. The academics are especially baffled by the decision to design HS2 to run ultra-fast at 240mph – that’s much faster than the 190mph normal for continental high-speed trains covering much greater distances. One of them, Professor James Croll of UCL, told BBC News: “It is just vanity for the UK to have faster trains than the usual high-speed trains. The group says the ultra-fast trains will also push up the carbon emissions the government is committed to reducing. They say the extra speed from ultra-fast services requires 23% more energy, but saves just 3.5 minutes from London to Birmingham. Professor Tony May from Leeds University told BBC News: “What’s needed is an independent, objective assessment of the alternatives. “These would include a less damaging version of HS2, a better-connected new line from London and transport investment in the North rather than to the North. Jeremy Heywood, the head of the civil service, has been investigating HS2 in an effort to cut costly elements. He is expected to report to ministers by the summer. Although Parliament has approved the first two phases of construction, details of the plan are still open to change and some in the Lords are still opposing. Jim Steer, founder of the pro high-speed rail group Greengauge, told BBC News there were many differences between the costs of HS2 and rail in France – but that the calculation of a five-fold difference was “not sound”. He agreed that ultra-fast running would increase CO2 emissions by about 20% but said it was better than people driving cars. The green movement has been split over HS2, with some veteran campaigners angry with major environmental organisations for not speaking strongly against HS2. The US has raised its import duties on Chinese steelmakers by more than fivefold after accusing them of selling their products below market prices. The taxes of 522% specifically apply to Chinese-made cold-rolled flat steel, which is used in car manufacturing, shipping containers and construction. US and European steel producers claim China is distorting the global market and undercutting them by dumping its excess supply abroad. The Commerce Department also levied anti-dumping duties of 71% on Japanese-made cold-rolled steel. China’s Ministry of Finance has not directly responded to the US ruling but on its website this morning it has said that China will maintain its tax rebate policy for steel exports as part of its efforts to help the bloated steel sector recover. These tax rebates are seen as favourable policies to shore up ailing steel companies in China, and to avoid massive job losses. Expect more fiery rhetoric from the US on China’s unfair trading practices soon. A separate filing by major US steelmakers to the International Trade Commission is looking to completely ban all Chinese steel imports. The US steel industry claims that some 12,000 workers have been laid off in the past year because of unfair Chinese competition. China claims the weak economy is more responsible for the industry’s problems and that it has taken steps to reduce its steel production. Last year, China’s exports of cold-rolled steel flat products to the US were valued at an estimated $272.3m (£188.5m). The London market opened lower, tracking losses seen in US and Asian markets overnight. The FTSE 100 was down 22.13 points or 0.4%, at 6,145.64, with mining shares among the biggest fallers. Fashion group Burberry slid 4.3% to 1094p after it reported a fall in full-year profits and said profits this year would be at the low end of forecasts. Burberry said it expected “the challenging environment for the luxury sector to continue in the near term”. On the currency markets, the pound fell 0.2% against the dollar to $1.4439, but rose 0.3% against the euro to €1.2826.